Tow sports is an activity that is growing as fast as adventure-seeking individuals can think up new ways to have fun while boating. A whole industry exists that promotes family-fun products that can be towed behind a boat. 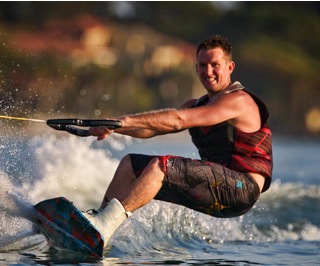 Today, tow sports is more than just waterskiing; it includes activities such as wakeboarding, knee boarding, tubing, and other inflated towable devices. There are specific watersports gear & products that make the sport safe and enjoyable, and even has associations and competitions to support and grow the sport. Having a great time doesn’t necessarily require a fast boat, just some common sense. Safety First – Always wear a properly fitted Coast Guard-approved life jacket for any tow sport activity. Select one that won’t ride up over your head and that provides adequate impact protection if you take a spill. Inspect Your Equipment – Check your equipment carefully for wear and tear before use. Replace and discard components that show signs of deterioration. Know the Area – Check out the area where you’ll be participating in tow sports ahead of time. Do not operate in shallow water, near the shoreline, or near docks, pilings, swimmers, and other watercraft. Turn Off Your Engine - Always turn off your engine when a rider is entering or exiting the water. Besides the danger of a moving propeller, a boat’s exhaust can produce carbon monoxide, a colorless and odorless gas that can be deadly. Listen To Your Rider - Remember that a rider has no control of the boat or its speed, so be sure to go over hand signals with the rider before he or she gets in the water. This way, a rider can communicate if they wish to turn, slow down, or stop. Observe Capacity Ratings – For inflatable tubes and similar devices that allow for multiple riders, multiple riders follow the manufacturer’s recommendations on weight limit and maximum towing speed. Always Use A Spotter – Required by law in most states, a spotter should have constant visual contact with the rider and relay information to the boat operator. Operate With Care – The driver should always look ahead and be mindful of other waterway users. Use caution when crossing a wake or operating near other boats, docks, or the shore. Know Your Limits – Always ski or ride within your limits. Operate or participate with control and at speeds appropriate for your ability. Don’t forget to read the operator’s manual before using any new piece of equipment. Not only are the safety messages important, but the manual may also provide tips on getting the most enjoyment from your new toy. Always respect the waterways, other waterway users, and those who live adjacent to our waterways. Ted Sensenbrenner is the Assistant Director of Boating Safety for the BoatU.S. Foundation, which is devoted to projects that promote environmentally responsible boating, and safe-boating practices.